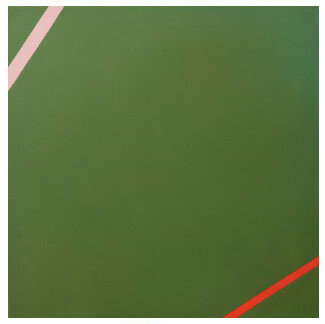 The trajectory of Turnbull’s painting over the course of the 1960s is one of reduction and refinement, as he makes increasingly smaller interventions within an overall field of colour. Writing about these paintings in 1967, critic Frank Whitford described this tendency ‘towards an absolute minimum of means... Turnbull wants to create a situation in which the spectator is directly confronted with an experience unmodified by interposing factors’. 2 It was not only surface texture which Turnbull sought to eliminate, having already removed all figurative imagery, he declared a further desire to remove all notions of shape in his paintings, and implicit within this was his resistance to the idea that either colour or shape be used to create pictorial depth. The idea of placing diagonal bands across the corners of an otherwise singular expanse of colour looks to have evolved directly from a painting, and perhaps others, made the year before. The image of a circle had been a recurring motif since the mid-1950s - over time Turnbull’s crude images of the human head were simplified to become circles, and these circles later expanded within the frame creating sections of a curve. In Untitled (Yellow Violet Arc), 1962, a fine-lined circle has expanded out, beyond the bounds of the canvas, creating two violet arcs at the top and bottom of the painting. It would take only a slight increase in the size of this circle for these two arcs to become four separate curves cutting across the corners of the canvas, from which point, it would take just a further, small step to arrive at the present straight-lined motif. In 30-1963, we see a band of pink and slightly thinner band of orangey-red placed at opposite corners of a field of green. Turnbull’s compositions are frequently predicated on the coexistence of some kind of formal opposition. Often these opposing elements have an imperfect symmetry - as we see here in the different angles and thicknesses of the two lines, which serve to animate their relationship. Turnbull requires just a small quantity of the two complementary colours to enhance the intensity of his rather prosaic field of green. Their addition creating a greater sense of ‘greenness’ than would be felt from an entirely green canvas. In two later paintings, the stark simplicity of this new compositional device is further enhanced by its translation into black and white, see the almost billboard sized painting 5-1963/64, and the portrait format 3-1966. 30-1963 is a small painting, it does not seek to overwhelm the viewer with an expanse of colour, but rather it has an insistent quiet presence. Resisting the romantic/heroic narratives suggested by Abstract Expressionism, which emphasised the unique ‘handwriting’ of the artist, Turnbull suggests that it is our own experience which completes this work. By foregrounding his painting as an object, Turnbull invites us to enter into a direct and unmediated relationship with the work - we are invited to perceive what is present and also what is not present, what is here and what is now.